Agnes Prest of Boyton | Launceston Then! taken from extracts from John Fox’s Acts and Monuments of Martyrs 2 vols. 1641. Foxe’s Book of Martyrs Plate VIII – Prest’s Wife and the Stonemason. During the reign of Queen Mary, she had decreed that Mass should be said in all churches. Failure to obey the Queens command was regarded as rebellion against the Crown. The penalty was to be hung, sent to prison or burnt at the stake. It was during Queen Mary’s reign that the story of Agnes Prest comes to the fore. 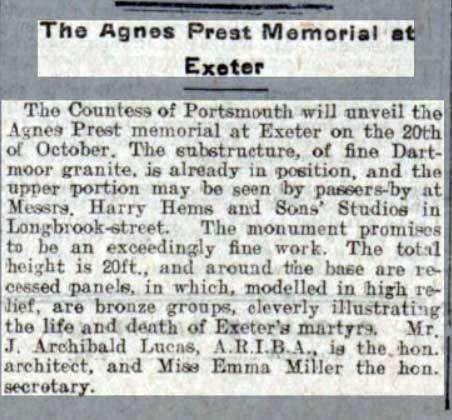 Agnes was originally from Cornwall, being born in 1503, but lived for a short time in Exeter as a servant. She had been brought up as a Romanist, but converted to Protestantism. She returned to Launceston where she married Prest. They made the living spinning whilst residing at Northcott Hamlet, Boyton. Agnes was known to be a cheerful, patient, sober and hard working woman. Although uneducated, she knew the Bible of by heart. Her strong conviction to her religion caused a serious breakdown in her relationship with her husband who was a Roman Catholic. She attempted to convince him to change, without any success. The children of the marriage were brought up as Catholics, and Agnes herself, faced pressure to convert. Acting under instructions communicated in a vision, Agnes left home, they being, as she said, ‘idolaters with whom she could not associate.’ She supported herself by general labour and spinning, but before long, she was accused by her neighbours of heresy. They took Agnes to the parish priest accusing her of heresy. She was arrested and taken to Launceston Gaol where she spent several months incarcerated. In the 4th week of Lent, 1555, Agnes, was indicted at Launceston for denying the Real Presence in the Sacrament of the Altar, and for saying that no Christian doth eat the Body of Christ carnally but spiritually. Before Judge Stanford, a true bill was found against her, and the petty jury also found her guilty and was handed over to Bishop Touberville of Exeter. Upon being taken to Exeter, Agnes was accused of speaking against the sacrament of the Mass, and calling it idolatry. She admitted the fact, and refused to go back to join her husband and children, saying that she thought it her duty to stick to Christ. She was ordered to be confined in the Bishop’s prison, but, being found to be very quiet, the keeper of the prison, after a short interval, took her home to his own house, where she was employed in spinning and carding, and other work, and was allowed to go about the city as she pleased. Her husband was now sent for from Northcott, but she positively refused to return with him, saying that he was not only an idolator himself, but allowed her to have no peace because she was not one also. 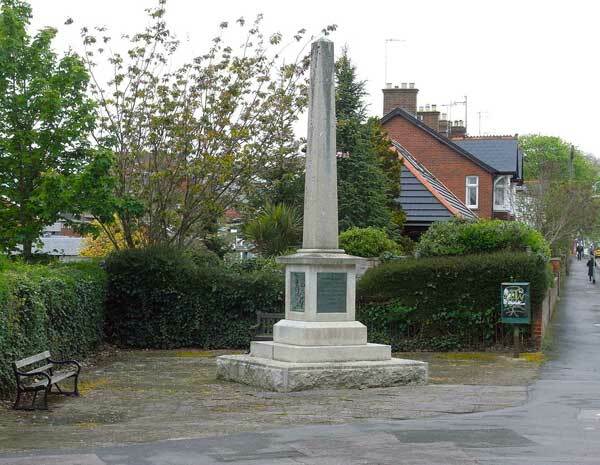 In 1909 a memorial was erected in Denmark Road, Exeter, to Agnes Prest and Thomas Benet, known as the Exeter Martyrs. 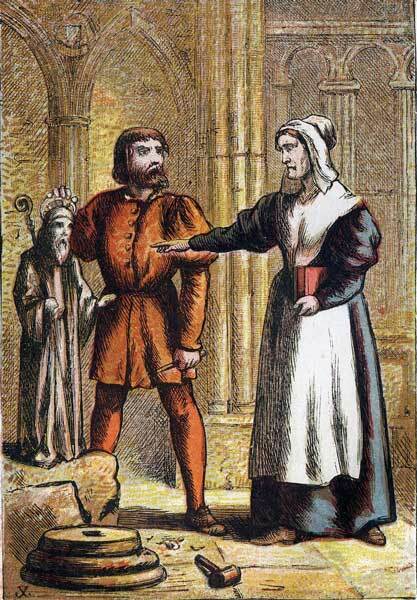 Thomas Benet died January 10, 1531 and it is believed that Agnes witnessed his execution. “To the glory of God & in honour of his faithful witnesses who near this spot yielded their bodies to be burned for love to Christ and in vindication of the principles of the Protestant Reformation this monument was erected by public subscription AD 1909. They being dead yet speak”. 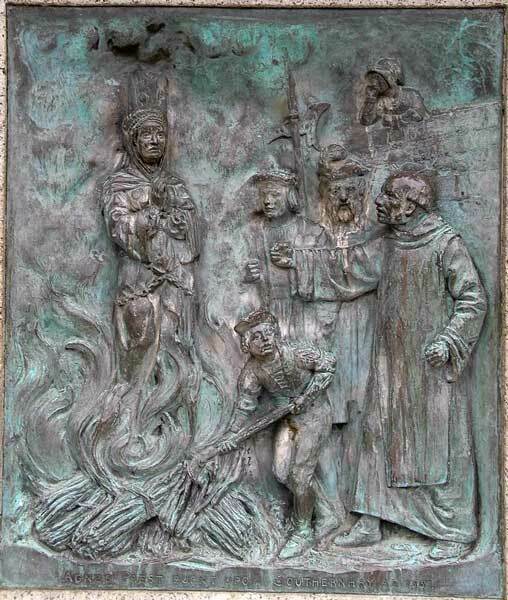 The death of Agnes Prest as represented upon the Protestant Martyrs Monument in Denmark Street, Exeter.